The less traveled Camino Inglés or English Way, gives you the real opportunity for experiencing the Galician culture. Despite its name, I found very, very little English spoken on the English Way! In the northwest corner of Spain is a region known as Galicia, the home for the Christian sacred site at the cathedral of Santiago de Compostela. The entire Camino Inglés stays within this region, a lush and humid, temperate marine climate. Rain can be expected in this very Celtic-influenced part of the world, in almost any season. The dialect spoken here is a mixture of Spanish and Portuguese, a dialect they call Gallego. “The boat is safer anchored at the port; but that’s not the aim of boats.” ~ Paulo Coelho, "The Pilgrimage"
Almost all place names in Galicia have two different names, one Spanish and one Gallego, so reading maps can at times be confusing. The port city into which we flew, is known as A Coruña in Gallego, and La Coruña in Spanish! I know only a bit of Spanish, yet I could recognize the difference between the two languages. In fact, to me it seemed that Portuguese was more influential! Below is our interactive Google map of the routes that are available There are two possible starting points, A Coruña or Ferrol, on the north coast. I must say, like with all true pilgrimages, this one took me outside of my comfort zone! I had read that one should learn as much Spanish as one can, before going on your Camino, because it will enhance your trip. However, I never thought I would need Portuguese as well! However, I adapted as best I could, and except for some consistent spelling variations, the words were often very similar in both languages. I was intrigued by the whole language mix. As I was to discover, later on the Camino to Finisterre (Fisterra in Gallego), it is all too easy to migrate to English-speaking people, to stay in your comfort zone. However, on the English Way, we ran into only a few English speakers, forcing us into experiencing the culture in a way we would never had otherwise! Once I adjusted to using my Spanish, I was thrilled and fascinated with our cultural exchanges. I really could do it! I could be a true pilgrimage traveler! The Christian medieval pilgrims from the North, who were mostly English would disembark in the ports of A Coruña or Ferrol, on the north coast of Spain and begin their pilgrimage to Santiago de Compostela from there. Hence, the name, the English Way. I discussed in The Way of St. James, that in order to receive an official Compostela, from the Cathedral in Santiago de Compostela, one has to walk at least 100 kilometers. The English Way from Ferrol is 116 kilometers total, according to my GPS tracks, and 75 kilometers from A Coruña. However, as of December, 2016, the Cathedral made an exception for the Camino Inglés from La Coruña, based on the tradition from the past of many pilgrims having arrived at this port. One can now receive the Compostela from A Coruña, with only 75 kilometers distance. Be sure you understand the new ruling carefully, as you must walk 25-30 km in your country of origin before starting in La Coruña, to make the full 100 km requirement. See this discussion for more information on the ruling. If you are from the UK, you must find a way to document your 25 kilometers prior to your arrival in Spain. The CSJ has lots of suggestions. If you plan to start in Ireland, you are lucky, as the Camino Society, Ireland has the now well-established Celtic Camino and offers many Irish pilgrimages to start your journey, with documentation to Santiago de Compostela. If you are from somewhere outside the UK this is a very confusing concept. So, in the USA, Australia or Sweden, from where would you start?? Interesting, isn't it? Shall we all start in Ireland, do their Celtic Camino, then book a boat to the north coast of Spain to finish the journey like in days of yore? It would be fun, wouldn't it? If you are initiating your Camino Inglés in Spain, in order to receive a compostela, you must start in Ferrol, at 116 total kilometers to Santiago. The route goes essentially southward, first eastward around the Ferrol Estuary, then south to Pontedeume, through the incredibly beautiful countryside, on small roads, paths and country lanes through Betanzos, Bruma and Següeiro, on the way to Santiago. Even though the Camino Inglés is the shortest of all the Caminos, don't be fooled! It is not easy. In fact, the Spanish friends that we made along The Way told us that the English Way is known in Spain for its difficulty! It is because of the long stages, with significant elevation changes and few services. This is rapidly changing as the English Way continues to become more popular. For the route starting from Ferrol, I have used my literary license and have broken up the traditional five long stages into eight days as shown below. This is now possible with the addition of albergues in Miño and Presedo. Day Seven ~ Hospital de Bruma to Sigüeiro, 24.46 Km (15.2 Miles) (I also offer suggestions on how to break up this long day if desired, click here for the web page. We have walked both routes, from La Coruña and from Ferrol. The way out of La Coruña is very difficult to find! Use our GPS tracks to help you. We wandered around quite a bit, finding the arrows that are often difficult to see. 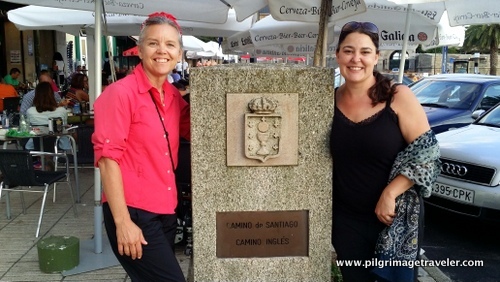 The Camino from La Coruña is lovely regardless if you are doing it as part of the Celtic Camino from the UK, or if you are out for a walk through Galicia, unconcerned about receiving a compostela. Plus the seaside city is fabulous, with many tourist sites as well as a beautiful beach. Plan on spending some time here before or after your Camino. You won't regret it. Click on the link for more information! 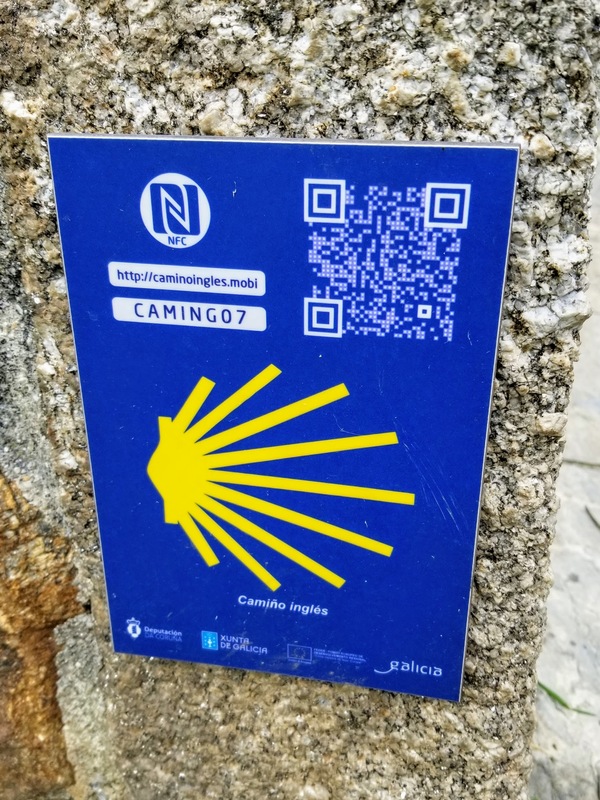 Something new to the Camino Inglés is the installation of signs by interesting places, utilizing NFC technology, or Near Field Communication. Most newer model cell phones have this technology pre-installed on the device. Just go to your settings where you would turn on/off airplane mode, WiFi, etc and you will see something that says, "NFC." Enable this setting to use this feature. The icon for NFC can be seen in the upper left hand corner in the photo below. That is the icon you will be looking for, to enable on your cell phone. If NFC is enabled, you can tap your cell phone against the sign to have the information come up. OR, if you prefer, you can go to the website, http://caminoingles.mobi, shown on the sign itself, and when prompted, type in the iBeaken code given on the sign. In the example above you would type in "caming07" that you see in to photo, and be able to see the page with the information. Click here, to see what information you would receive in this example. Or just plug in the information for yourself to try it. It is quite interesting if you have the time and/or patience to use this feature along your own Camino Inglés. You may have to install the i-nigma.mobi app on you cell phone, to use this feature. I tried to do this but I ran out of patience because I couldn't get it to work right off the bat. The app states this: "In order to install i-nigma, you need to use your mobile phone browser and browse to www.i-nigma.mobi directly. Then please follow the installation steps. Installation process uses information retrieved from the phone browser in order to determine phone capabilities and to install the correct software version." Good luck and may this information be useful to you! Someone worked very hard to provide it to you! It is difficult to find the official starting point in the docks in Ferrol It is directly across from the Tourist Booth, at the docks on the street called Paseo da Mariña. Use our GPS tracks on the Google map above to guide you. On my first trip here in 2014, we had such an incredibly difficult time finding the exact location of the start of the Camino Inglés, and the locals were unable to help us. I will relate very specifically how to find it. You first walk or take the bus to the docks, on the west side of the naval area. If you arrive in Ferrol by bus, you need to walk westward, and south towards the water. After securing your accommodation for the night, it is our advice that you locate the start of the Camino the evening prior to your first day, to get the best lay of the land. 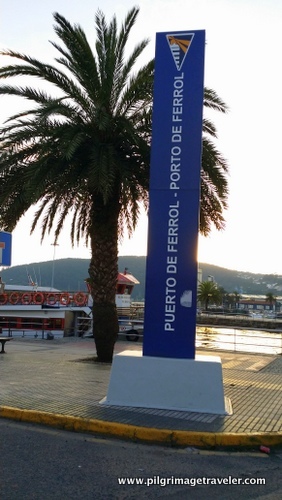 The first landmark, to know that you have arrived in the right place is this Port of Ferrol sign. It is a beautiful waterfront, and we arrived close to sunset, so the light was serene and low. Made for a wonderfully lit seascape to set the ambiance for our Camino! 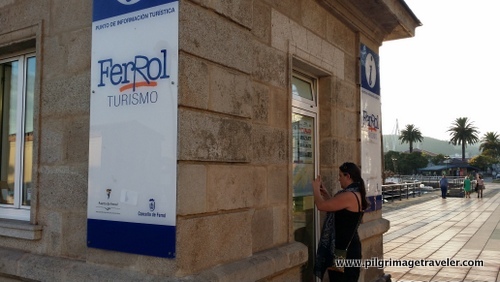 I knew to look for the Tourist Booth, and sure enough, we found it just beyond the Port of Ferrol sign, above, on the same side as the waterfront. Of course, I knew it would be closed late in the evening, so when we found it, it was no surprise that indeed it was closed. We had already gotten our Credential stamped at our hostal, to document our start in Ferrol, but if you are lucky enough to arrive at the tourist booth when it is open, you can get your first sello, or stamp here. Here is a photo of my first Camino Inglés partner, Shelly, taking a photo of the Ferrol Harbor map posted at the Tourist Booth that turned out to be helpful. Directly across the street from the tourist booth, by a café is the plaque that marks the official start of the Camino Inglés. Here I am with Shelly again, posing with the official marker. This is what you must find. Please see day one for the rest of our more recent journey out of Ferrol, from this official plaque that begins the Way. For booking.com accommodations in Ferrol, click here. I would definitely recommend an advance reservation for this town. We bused over from La Coruña in the late afternoon in early September, and had to walk around quite a bit to find a place that was free. Or, try to get there early in the day. This may be sufficient! I hope you have enjoyed our introduction to the Camino Inglés. I hope you journey onward with us, the pilgrimage travelers, through the Galician countryside to Santiago de Compostela. May you feel full of anticipation, as you wander from the safety of your moorings, and be like a true pilgrim as you experience the journey with us! ** The new and improved version of our guide book, as of 8/2018, is now available to purchase. This digital eBook, in PDF format, now has all the the updates in the route changes that happened in 2017 and 2018! Click here for more information.